If you have been reading Parenting Gamers for a while, you probably know I am a fan of Minecraft. It offer opportunities for gamers to express themselves in ways other games don’t. It stretches their creative muscles. And it is a great way for you as a parent to help your gamer begin to know themselves. One area where Minecraft is really starting to grow is schooling. It can be adopted to teach things like geography and physics. It is a great way to use something kids are obsessed with to help them learn. One group doing this is Connected Camps. This summer they are running a “Summer of Minecraft”, a “4-week camp experience“. Register to play on our moderated camp servers for the complete 4-week camp experience, accessed in the comfort of your own home and at your convenience. Kids will learn with expert counselors in a safe, moderated, multiplayer environment. Recommended for kids age 9-13. Challenges are more fun and productive when kids and grown-up�s engage together! 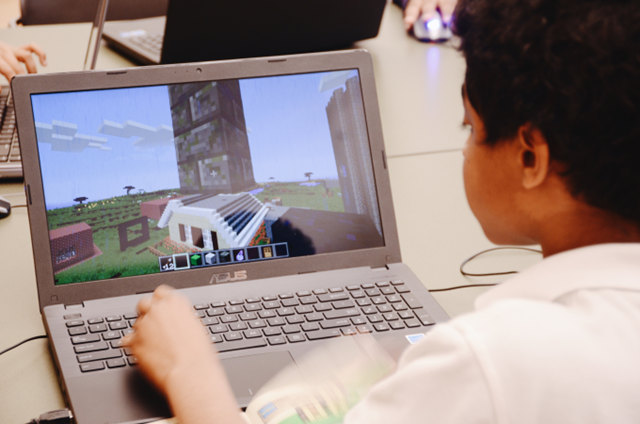 Sign up for our 4-week parent camp to learn how to play Minecraft, get support from other grown-up�s, and connect with camp staff and community members. I believe strongly that the best way to connect with your gamer is to play with them. This camp offers the opportunity for you to learn how to play Minecraft in a safe, calm environment. Then you can take that knowledge and use it to play with your gamer. The camp runs from July 6th to August 2nd, 2015. The prices are $150 for the kid camp and $25 for the grown-up one, with a 25% discount if you sign-up more than one person. Also, they have been generous enough to off a 30% discount to Parenting Gamers. Just use the code PG30 at checkout. You can checkout more about it in this video.